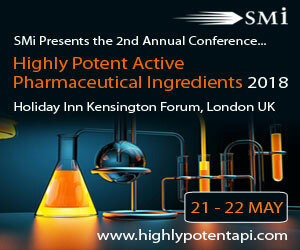 The Highly Potent Active Pharmaceutical Ingredients conference will be hosting 2 interactive half day post-conference workshops on the 23rd May, presented by HPAPI Project Services Limited and Affygility Solutions LLC. Biopharmaceutical companies embody application of the scientific method to identify and deliver new patient therapies. The same systematic, scientific principles should be used to develop and deliver research, development and production facilities that are fit for purpose and which protect healthy workers. This workshop will explore key HPAPI project elements in a stepwise manner, helping define and deliver HPAPI projects that are technically sound, based on justifiable data which can underpin robust and defensible investment. This workshop will provide an overview of the regulatory basis for ADEs and PDEs, will discuss how they are determined and present the basics of preventing cross-contamination. Since June of 2015, the EMA’s requirements for developing and implementing health-based exposure limits in multi-product pharmaceutical manufacturing facilities has been in effect. Unfortunately, there is still much confusion and misunderstandings on how these health-based limits are to be implemented. If your company handles multiple products in the same facility, this workshop is ideal.